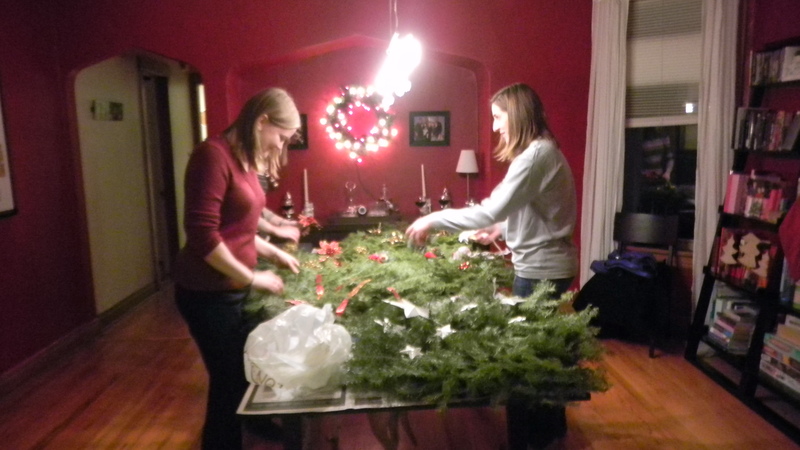 Last night I hosted a wreath decorating party for a few of my friends. We bought some wreaths from Alive Rescue, as one of their fundraisers, and thought it would be fun to decorate the wreaths together. My friend Erin and I did this last year, and it was fun to add more people to the tradition this year. 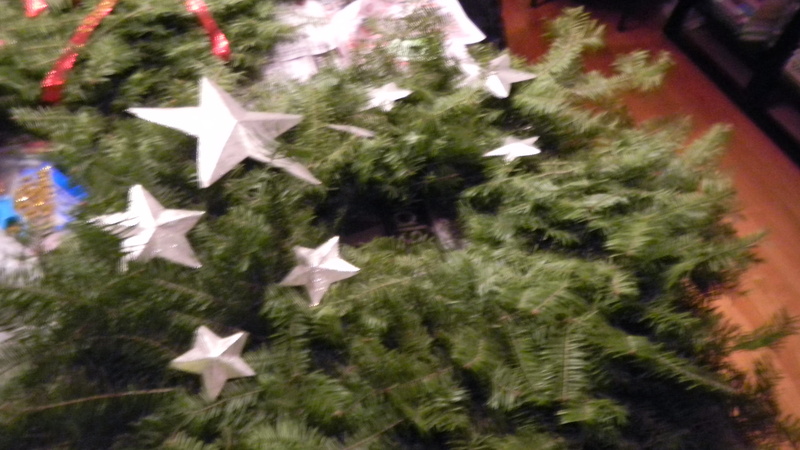 I kept mine simple this year and created some silver glitter stars ahead of time to attach to my wreath. Can you guess what the stars are made from? 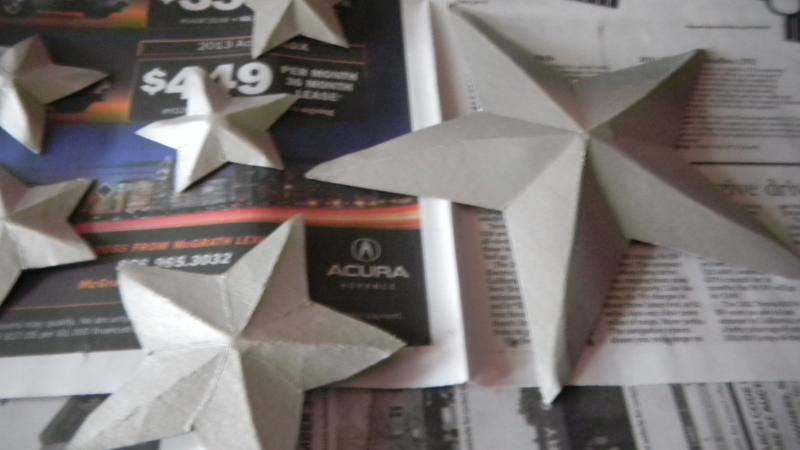 I used cookie cutters and free-handed a large star onto the cardboard and cut them out. With a pencil, I drew lines from the center of each star to the points. Then, I traced over the lines with an exacto knife. I did the same thing for the folds inward. 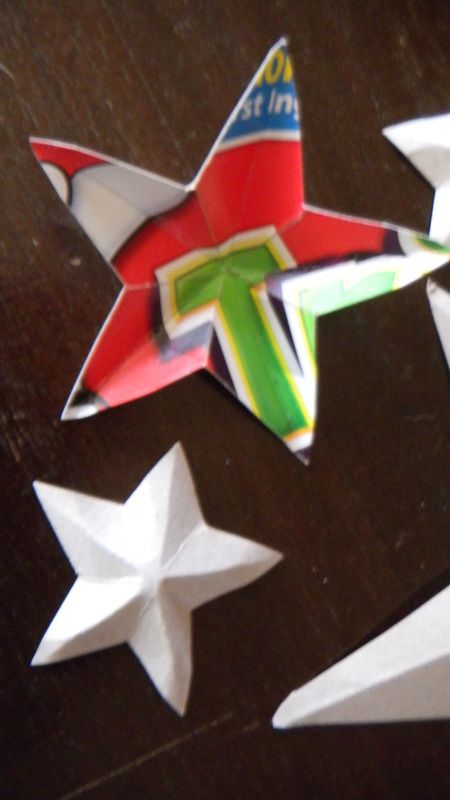 After some cardboard bending, I got some pretty cool looking 3D stars. To get them sparkly silver, I had Dan spray paint them using some silver paint we had laying around. After they dried, I dabbed on two coats of sparkle paint. Not exactly the most difficult craft in the world, but I was very pleased with the result. They look like shiny metal stars, which was exactly the look I was going for. All in all, a fun night of wine, more Elf, glue guns, and good friends. My annual holiday party is coming up in just a couple weeks, and we’re trying out a new gift idea this year. You read that right. When we agreed to participate in the gift exchange, we all e-mailed in a few items, within the price limit, that we would like to receive as presents. Links were included. This is shopping made easy, folks. The idea came to one of my friends as we watched another friend open gifts at her bridal shower. She commented on how easy wedding gift giving was, since the couple had a registry. They were bound to like what you gave them, because they had already picked it! As a former bride myself, I had to agree. It was fun opening all the gifts, and I loved each and every one of them. It didn’t matter that I already knew what the presents would be, it was still just as surprising to see who got you the gift. This may not seem like a novel idea, as people use Christmas gift lists all the time, but this is the first time trying this method out with our group. Past gifts have mostly consisted of either one to one gift exchanges, small gifts that are the same for the whole group, and a cookie exchange where the cookies were our gifts to one another. We may have found a winning idea this year. 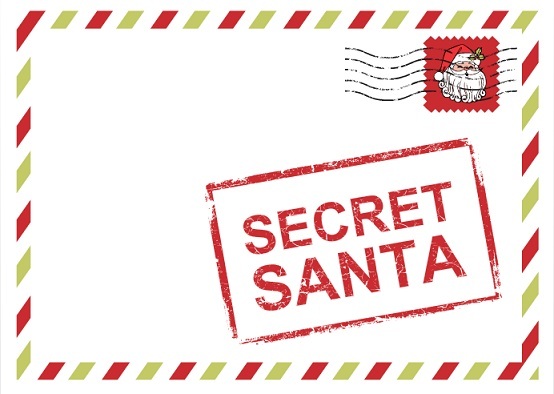 The key is having a nice third party who will create the Secret Santa pairings and send the corresponding registries so all Secret Santas remain a secret. This year, Dan helped us out by being my elf (he hates it when I call him that), so I have no idea who has me. I think this will really work well. I know I for one found this system to be extremely helpful and made Secret Santa shopping so simple! 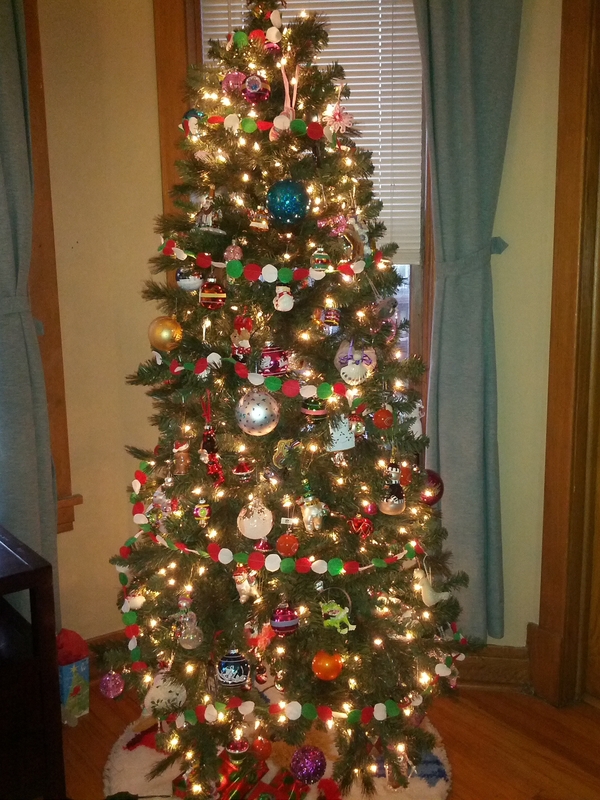 I had intended to make felt circle garland for my Christmas tree last year. Somehow, the holidays got away from me and a couple days before Christmas, I realized (1) I hadn’t cut out any of the felt circles, (2) I didn’t have access to a sewing machine, and (3) there is no way the garland was being made in time for Christmas this year. Oh well, the best laid plans. This year, I set out on this project early, so I could get it done. Even then, I was still frantically cutting out circles while at my in-laws’ house to use their sewing machine. This project definitely got some big help from my family. I used this blog tutorial as my basis for the project. 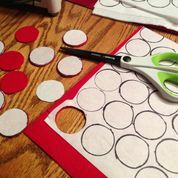 It had the wonderful idea of ironing freezer paper to the felt to get better shaped circles. Genius. 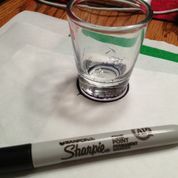 Once the freezer paper was ironed on, I used a shot glass and a sharpie to trace a ton of circles. You can guess what came next – lots of cutting. 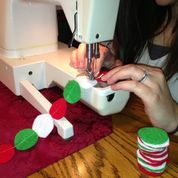 In total, we used 2 sheets of felt each of red, white, and green. When the circles were cut out, it only took a little tug to remove the freezer paper from the felt. 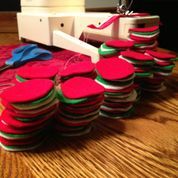 To make the sewing process go quicker, we stacked the circles in the order they needed to be sewn: red, white, green. Finally, Dan’s mom got out her old and trusty sewing machine and showed me how to use it in a very, very basic way. I found it most difficult to keep sewing at a steady pace while having to constantly feed another circle into the sewing machine. I ended up only sewing about 20 circles myself until the pros took over and I went back to my great skill: cutting. 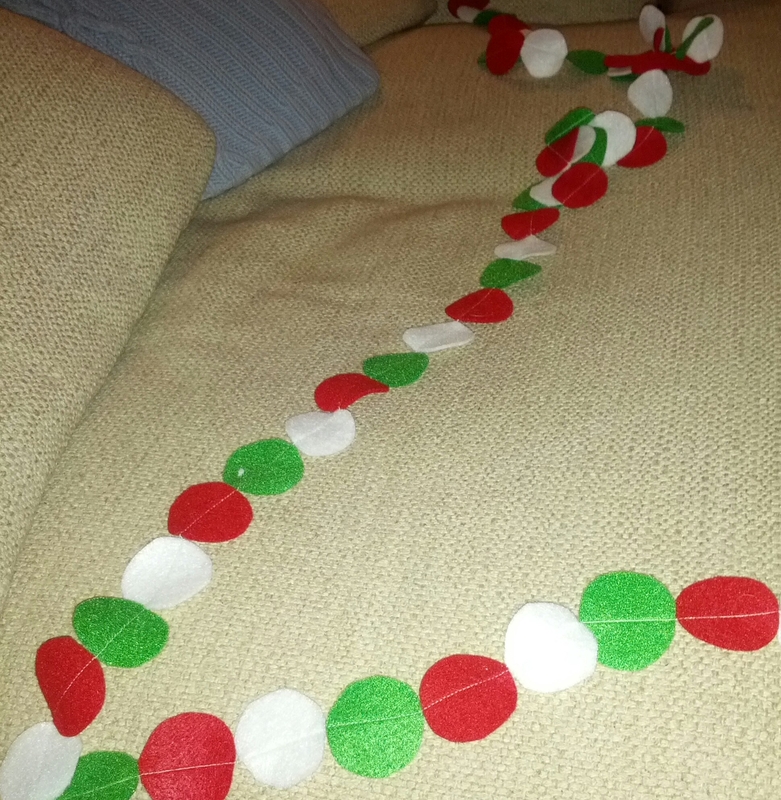 We ended up with a pretty long piece of garland that was maybe 25 feet long. Dan draped it on the tree the next day, and I was so happy to have the cute whimsical garland I’d been wanting for over a year. We’ll be sure to enjoy this craft for years to come.